#SugarFreeSeptember || Day 29 - CounterCultural. CounterCouture. First of a confession. As soon as I reached work today I let myself down and had one of Emma’s cupcakes. In my defense, they were to celebrate her leaving but that’s not really much of an excuse. But enough dwelling on my slip ups and on with the show… well, menu. Breakfast was a rather delightful if hurried affair as I did my best to make it in time to be picked up for work. I had a stack of protein pancakes soaked sprinkled with lemon juice and a rhubarb activia. I had a nice glass of almond milk to wash it all down. Most refreshing. Lunch was another protein rich salad, using the same recipe from day 27. I had two sticks of celery as well, just because I like something to munch on. Or should that be crunch? It’s just a shame it was cold. I need to invest in a good quality food thermos for hot lunches with this cold weather coming up. It’s that or the microwave and instant flavoured rice. Any suggestions will be most readily welcomed, whether for thermoses or hot food. Dinner (above) was a spur of the moment creation based around my craving for fish. 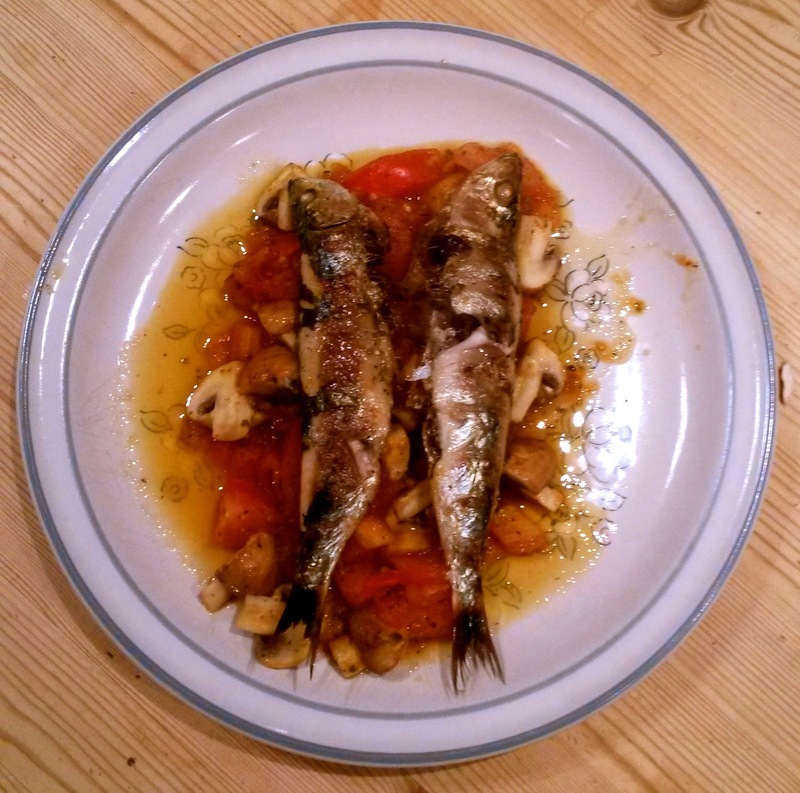 I do love myself a couple of grilled sardines. Grilled to the point of juicy, I served them up on a bed of fried tomatoes and mushrooms with marjoram and lashings of lemon juice. I quite possibly used too much lemon but I’m not a fan of tomatoes so didn’t mind too much. And the best bit? I didn’t have to share it with anyone else! Win! So that was my penultimate day of #SugarFreeSeptember. Apart from my morning hiccup, it has been a successful and tasty day. The only problem is I’m craving more sardines with lashings of lemon juice.